We recently awoke from our latest gin-induced stupor to discover that yes, England really did contrive to lose every Test in the Emirates over the winter. This chastening defeat made us hark for simpler times, when Neil Mallender and Derek Pringle would spearhead the charge to victory over a Pakistan containing not only cricketing legends in the form of Wasim Akram and Waqar Younis, but commentary legends too, in Rameez Raja and Aamer Sohail. Back in those days England chopped and changed their batting order like it was going out of fashion; meaning that each new man got not so much a run in the side as a quick skip before they were cut down and chucked into the Tiber. 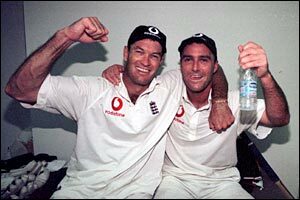 One such man was in and out more often than Tiger Woods on speed and is the latest man to join the haphazard crew that is the Unlikely Lads; Graeme Hick. Most of us remember the hype and build up which surrounded Kevin Pietersen as he edged closer to becoming eligible for England. The same has since been true, to a lesser extent, of Craig Kieswetter, and to an extent so low it has been unnoticeable; of Shaun Ervine. 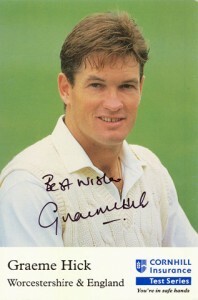 Graeme Hick was the first man to feel the weight of expectation which would later fall on Pietersen, in particular. Born in Zimbabwe, he qualified for his adopted country in 1991, by which time he was already dominating county attacks for fun. His domestic stats are, quite frankly, ridiculous; having arrived at Worcester in 1984, he went on to average over 50 every season until he was picked by the national side. He peaked in 1990, where a demolition job of the county circuit saw that average power past 90. That season he scored his 57th First Class century aged just 24. With a record like that behind him it isn’t difficult to see why the weight of the world was on his shoulders, but at the same time living up to expectations was going to be an almost impossible task. When you’ve been built up as England’s saviour, you’d like a nice easy game to ease you into the Test arena; Zimbabwe themselves, perhaps, or at least a New Zealand. What you probably don’t want is the West Indies and a four-pronged pace attack of Patterson/Marshall/Ambrose/Walsh. Twelve runs in his debut match, then two ducks and a one in the next three Tests saw him whisked out of the side quicker than you can say ‘bubble burst’. It set a pattern for his career, where a perceived weakness against genuine pace bowling coupled with a mental fragility meant he suffered at the hands of the Australians especially and his potential was destined to go unfulfilled. Even with those issues, it could still all have been so different. In much the same way Ian Bell finally came of age in South Africa three years ago, Sydney 1996 could have been Hick’s defining moment. The dismissive, imperious batsmen the county circuit knew so well finally emerged into the international arena, but he got stuck in the 90’s – perhaps his psychological failings got the better of him – and Mike Atherton infamously declared with him stranded on 98*. It was a well-intentioned move; the captain felt England needed to give themselves enough time to bowl their opponents out, but watching Mark Taylor and Michael Slater put on 200 for the opening wicket as Australia eased to a draw must have been painful viewing indeed for a man who would never score an Ashes ton. Not that his career was a complete failure, he is eighth on the all-time list of first class centurions with 136, and even on the highest stage he scored six hundreds, as well as being part of the England team which won in Pakistan and Sri Lanka at the turn of the millennium. His 40, in a vital partnership of 91 with Graham Thorpe, is an oft-forgotten innings which helped take them to that famous victory in the Karachi gloom. That was to prove the final highlight of an international career which never took off as it was supposed to. His final England appearance was in Kandy two Tests later, and before long the likes of Usman Afzaal would step confidently into the breach. Whenever conversation drifts onto the likes of Hick, or Mark Ramprakash, someone inevitably puts down the gin, gazes into the distance and whimsically states that ‘if he broke into the side now, he’d have been a success’. Maybe he would, but even with a more settled run in the side the mental weakness may still have been there. It was that, rather than any glaring technical hitch, which caused him to underachieve. The anticipation before his debut was immense. He’d faced Hadlee, Marshall, Imran and others with conspicuous success for Worcestershire, so nobody worried about him in Tests. Until he played one.